**UPDATE 9:42 a.m. Thursday, March 10**: Because of heavy rain forecast for Sunday, March 13, the #SnoCoSqueeze is once again postponed and there will be no lane reductions for March 11-14. The project involves striping a work zone Friday evening with a goal of re-striping the roadway back to its normal dimensions by the Monday morning commute. Rain on either Friday or Sunday leading to water on the roadway means that lane striping can't be done. We're evaluating our options and planning to begin the work on Friday, March 18, weather permitting. **UPDATE 2:37 p.m. Thursday, March 3**: Rain is forecast again for this weekend and so the #SnoCoSqueeze is postponed. There will be no lane reductions March 4-7. Because we have to do lane striping for a work zone and then re-stripe the roadway back to its normal configuration by the Monday morning commute, we need dry weather. It's impossible to paint lane stripes with standing water on the roadway so we need dry conditions Friday and Sunday and that is not in the cards. We're now hoping to begin work on replacing the expansion joints on the I-5 Steamboat Slough Bridge March 11-14. After the first week of the #SnoCoSqueeze was rescheduled (thank you Pacific Northwest rain), we are ready to get up and going this weekend (March 4-7) replacing aging expansion joints on I-5 between Marysville and Everett. Again, we need a stretch of dry weather to be able to properly re-stripe lanes and ensure that the concrete cures correctly, so we're keeping an eye on the forecast and our fingers crossed that we don't have to postpone again. We need to restripe the highway to create a large enough work zone and then restripe it back to normal in time for the Monday morning commute. If rain is forecast for either Friday night, Sunday night or both, we can't work because we can't paint on wet pavement regardless of how good the weather is on Saturday or Sunday. We recognize that this is still the rainy season but we're trying to get this work done now ahead of the busy summer travel season. If you haven't heard yet about the #SnoCoSqueeze, we have aging expansion joints all over our highways, especially on I-5, and as funding becomes available, we're working on getting them replaced. That time is now for Snohomish County. We are replacing 41 expansion joints on I-5 between Everett and Marysville. To do so, there will be eight weekends of reduced lanes starting the night of March 4. In most cases that means from 9:30 p.m. Friday until 5 a.m. Monday for eight weekends, drivers will need to plan their trips around some potentially heavy traffic. The joints range in length from 48 to 71 feet and getting old ones removed and new ones installed is no easy task. Even after the old joint is chipped out and the new one installed, the concrete needs a full 12 hours to cure. There isn't enough time during a weeknight overnight closure to get this done so we need full weekends. For drivers, that means possible weekend backups and delays as the work is completed. Two lanes will remain open during the day but the speed limit will be reduced to 40 mph through the work zones as the lanes will narrow and we want to keep everyone safe. This is the first major work Snohomish County has had of this kind in a long time. While we're getting this work done, we're asking drivers to, whenever possible, consider alternatives. Carpool or vanpool if you can. Traveling early or later in the day will help avoid weekend congestion that could resemble a weekday commute. This work is vital for the future health of our highway as well as the safety of those who travel on it. Our crews will work as quickly and safely as they can, and we appreciate your help as we complete this major project. UPDATE - February 25, 1:28 p.m.
#SnoCoSqueeze work for this coming weekend has been rescheduled due to the weather forecast. Expect work scheduled for Friday, Feb. 26 to Monday, Feb. 29 to now begin Friday, March 4. We've all seen what a broken expansion joint can do to a commute: miles of backup, huge delays and plenty of stress and frustration. We have aging expansion joints all over our highways, especially on I-5, and as funding becomes available, we're working on getting them replaced. Snohomish County, your time has come. We are in the process of replacing 41 expansion joints on I-5 between Everett and Marysville, and that work really picks up steam this month. There will be eight weekends of reduced lanes starting the night of Feb. 26. That means that in most cases, from 9:30 p.m. Friday until 5 a.m. Monday for eight weekends, drivers will need to plan their trips around some potentially heavy traffic. Replacing 41 expansion joints is no small feat. The joints range in length from 48 to 71 feet. Even after the old joint is chipped out and the new one placed, the concrete needs a full 12 hours to cure after it's laid out. Getting a time frame adequate enough during the work week to get all that work done is not possible for the largest joints. We need full weekends to get this done. For drivers, that means facing possible weekend backups and delays as the work is completed. Two lanes will remain open during the day but the speed limit will be reduced to 40 mph through the work zones as the lanes will narrow and we want to keep everyone safe. Anytime you do major work like this that involves lane reductions, it's going to create traffic issues and we thank you ahead of time for your understanding. This is the first major work Snohomish County has had of this kind in a long time. While we're getting this work done, we're asking drivers to, whenever possible, consider alternatives. Carpool or vanpool if you can. Traveling early or later in the day will help avoid weekend congestion that could resemble a weekday commute. When’s the last time you paid attention to a work zone? I mean really paid attention? We all drive past them, but do we really do much more than grumble as we realize the lane we’ve been traveling in is about to end? Earlier this month, I was in one of those work zones and believe me I didn’t tell my mother about it beforehand. I’m pretty green here at the Washington State Department of Transportation so when an area maintenance supervisor up in Skagit County invited me to join his team for a guardrail repair job, I jumped at the chance to get out into the field. WSDOT is lucky enough to have Road Warriors. 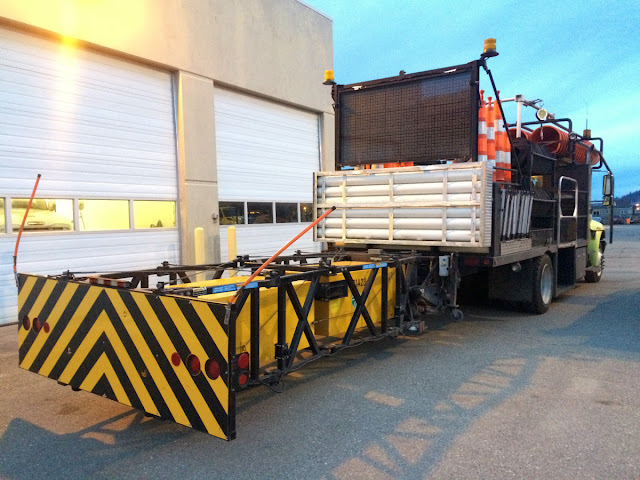 These utility vehicles hold flags and barrels, provide collision barriers to protect crews (that back trailer goes up for storage when it’s not in a work zone), have wells for easier and safer work zone barrier placement and have lighted sign abilities to inform drivers that lane closures are happening. For you Transformer fans they’re to WSDOT crews what Bumblebee is to Sam Witwicky. Crews use the Road Warrior truck to lay out cones for lane closures as well as warning drivers of a work zone ahead. I’ve jumped out of an airplane before but that adrenaline rush was nothing like being in a work zone. Skydiving is a bit surreal while everything about road work is very real and just one distracted driver away from disaster. If you ever hear someone saying WSDOT crews are shutting lanes longer than necessary please let them know that is not true. The crew I worked with wanted to get that work zone put up, the work done and get off that highway as quickly as possible. We started out by getting two Road Warriors on northbound I-5 about three miles before the work zone in Burlington. We moved over into the passing lane – and yes, we were those vehicles that weren’t passing in the fast lane – that was the lane we needed to close as we prepared for median guardrail work. I realized quickly just how dangerous this part of the operation was when a semi that didn’t like our speed blew past us on the right. The honk he threw our ways wasn’t because we were doing the horn motion we all did as kids. As we neared the work zone, we continued to slow and both Road Warrior operators flipped the lights on their rear signs so red flashing arrows showed up. The lead truck I was in came to a stop and the following truck stopped a distance behind us. Both had lowered their impact barriers and now the guys who were doing the barrel placement got ready. We had three guys on the back of the first truck. They were wearing full reflective pants and tops, hardhats and were harnessed into tie points. Together, they worked to pull down, assemble (barrels with their heavy rubber stands) and then set them out on the road. It would be unsafe to abruptly block a lane so we started with a taper into a lane closure. These barrels were gradually placed from the median toward the middle of the two lanes. The toughest part seemed to be the first half dozen barrels. Nothing is blocking the lane except for these two vehicles. You’re hoping drivers see the flashing red lights and move over and slow down. The Road Warrior started as far into the median as it could to drop the barrels. From there on out it was pretty smooth sailing as the guys on back communicated with the driver through a hands-free headset making sure the speed and direction was appropriate for the best barrel placement. The guys made this happen quickly. 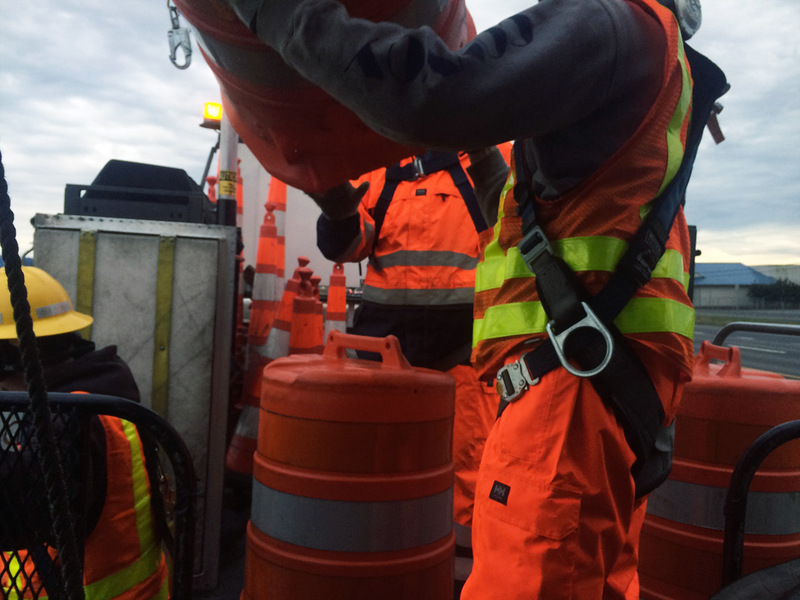 In approximately 30 minutes they had a two-mile work zone coned off with Road Warriors in position behind each of the two different crews that were working. I was stationed up with the northern crew who were out of the trucks and moving with tools before I could even get my seatbelt off. They immediately got to work unscrewing short but mighty bolts holding the guardrail to the posts and digging out the wooden 4-by-8 posts to check for damage. 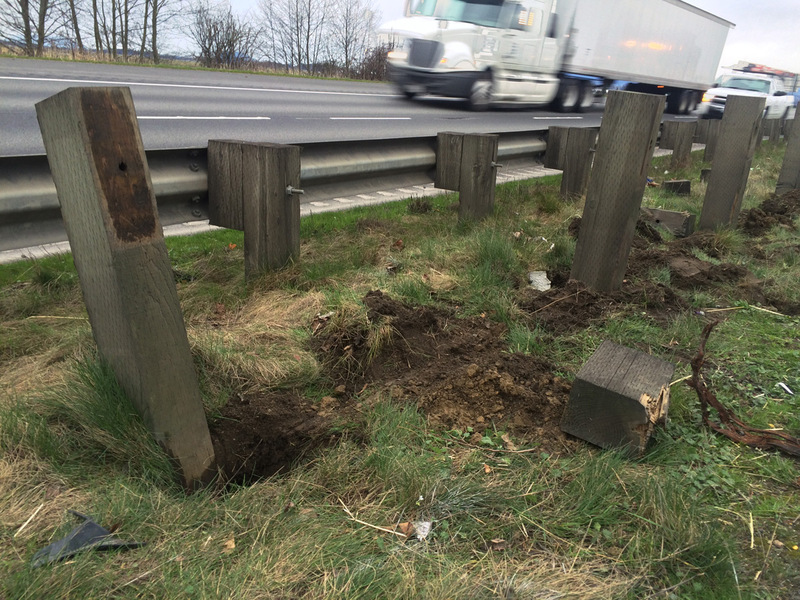 Several posts also have to be replaced along with the guardrail after being hit during a collision. I spent most of my time watching from a spot in front of an equipment truck, constantly swiveling my head back to check traffic and make sure passing vehicles were staying right. On this day, they did, and I can’t thank you enough for slowing down and giving the workers room. Before I knew it, these guys had a post replaced (only one in this section was damaged by the guardrail impact) and the new metal rail attached. The alignment was checked, bolts were tightened, the holes filled in and the guys were moving ahead to the next section. 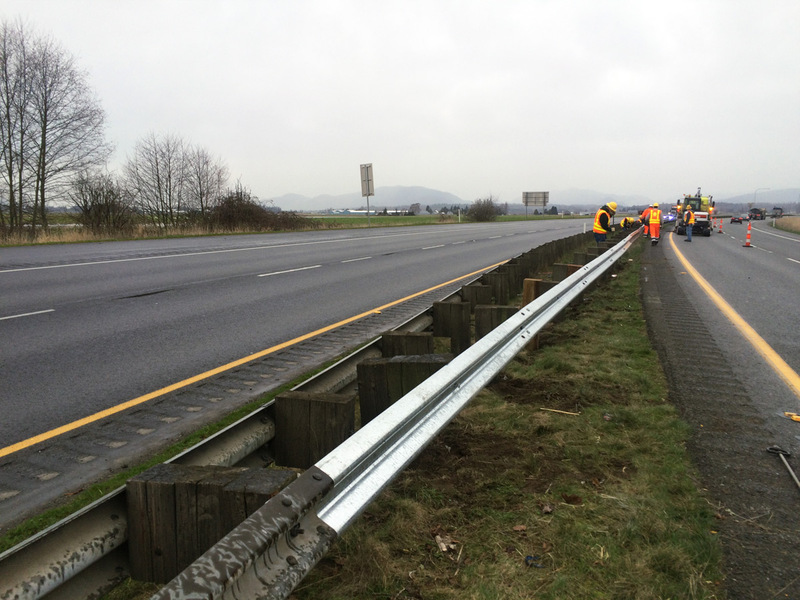 The final result: A new section of guardrail to replace one damaged by a vehicle strike. I was really impressed with the speed and efficiency the crews showed. They clearly work as quickly as they can, both for your convenience and because they’re working just feet away from 60 mph traffic and want to get out of there safely. It is not the most friendly work environment; I’d say crocodile wrestling might be less risky. To see more photos from this maintenance project, you can visit the WSDOT Flickr page. Thanks to this experience, I gained a better understanding of the risky job our workers do each day to make sure our roads are safe. Thank you to the drivers who did a great job of really paying attention to signs and this work zone. I’m off to call my mother now to tell her about my day, and I’m sure she thanks you too. After four months, you’re probably used to our report-outs on I-405 express toll lanes performance, trends, challenges and adjustments. Today, we want to introduce a new and important category to the reporting mix – finance. 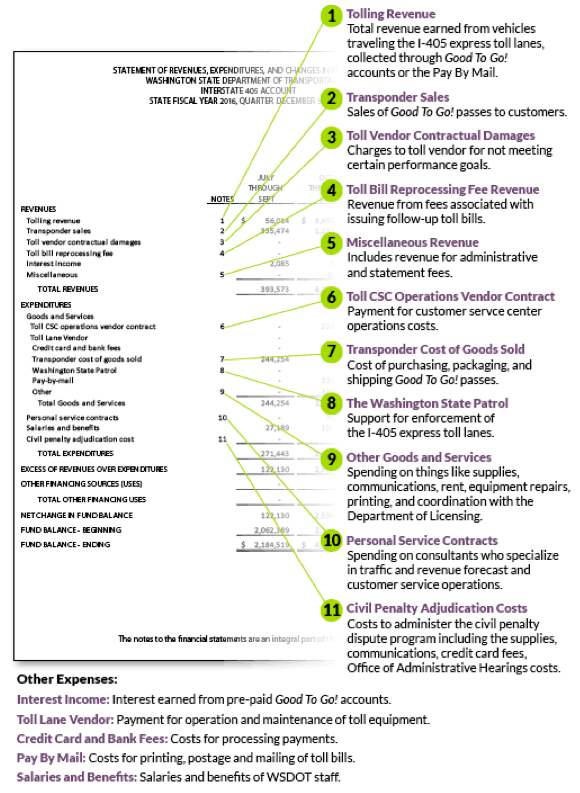 We publish financial statements every three months to help you understand exactly where your toll dollar goes. We do this to show how we are being accountable with toll-payers dollars and transparent about revenue and the cost to collect tolls. A: This shows you all of the revenue earned, then takes the gross revenue earned and deducts all of the costs to collect a toll, and then you end up with what net revenue remains. Q: What is this telling me? A: Revenue from express toll lanes is saved in a dedicated account in the state treasury just for use on I-405. This statement shows that after the first three months of express toll lanes there is $4.7 million in that account. Q: What makes up the $4.7 million? Drivers made 2.75 million paid trips in the express toll lanes, which generated $3.7 million in toll revenue. After including other revenues, which mostly include Good To Go! pass sales, revenue equals $5.2 million. After deducting $2.5 million for expenses for customer service, credit card processing fees, costs for Good To Go! passes, Pay By Mail printing and postage, WSDOT and consultant salaries, that leaves $2.7 million. Lastly, then you add in $2 million which was already in the I-405 fund through a loan from the gas tax intended to cover operating costs prior to the opening of express toll lanes and cover the costs of Good To Go! passes allocated to I-405, that leaves you with $4.7 million. Q: How do I know that WSDOT isn’t going to spend this money on other things? A: I-405 express toll lanes revenue is saved in a dedicated account for future reinvestment in the I-405 corridor, monitored by the Office of Financial Management. Q: What projects will the revenue fund? A: The Legislature will decide what corridor projects need the revenue. Q: Did 70 percent of I-405 toll collections go to that vendor in Texas? A: No. This vendor is only paid to do the work they are contracted to do and not based on how much toll revenue is generated. Q: Will future financial statements reflect similar results? A: No. We anticipate operating costs will be higher as the system moves beyond the ramp-up period and operations steady. We will have stronger data on operations spending and revenue after the end of the fiscal year (around October). A: Drivers are showing us their time is valuable. Our original forecasts projected 1 million tolled trips in the first three months, when there were actually 2.75 million paid trips in the express toll lanes. Since the number of trips was almost three times higher, the amount of toll revenue was also higher, $3.7 million, vs. the projected $1 million. forecasts and computer models regularly to measure avalanche risk. How are you at predicting the future? That’s the ultimate job description of our Avalanche Control crews, who work throughout the winter and early spring keeping our passes clear and the traveling public safe. They’re tasked with both anticipating and preventing natural avalanches that could cover highways and bury vehicles. They don’t peer into crystal balls, but they do use a variety of tools – including explosives – to keep one step ahead of the snow. By definition, avalanche control work means closing passes while snow slides are triggered and then the roadway is cleared. We know that’s disruptive to travelers and, when possible, we schedule the work for non-peak hours. Sometimes, though, conditions and the safety of motorists and our crews working the passes don’t allow for delays. So, how do we decide when to conduct avalanche control work? The short answer is whenever we feel the risk of a natural avalanche on the roadway is too high. content to determine the density of the snowpack. The longer answer is that it’s a complicated alchemy of science, weather forecasts, historical data, traffic volumes, maintenance equipment availability and just general “snow sense” that our highly skilled crews calculate every day. Our avalanche crews start with the science, including detailed weather forecasts, computer models and historical slide information. Snow pack information, temperatures, wind speed, wind direction precipitation and snow levels are all tracked to see which – if any – are increasing that day’s avalanche risk. Next, they move on to the snow. Snow consistency is studied and measured for water content and density. The snow’s temperature is taken and large blocks of snow are examined for any evidence of shears – or weak spots within the snow pack that could break loose and act as a sliding layer to bring snow down the mountain. The final step is that little something extra that comes with experience – a sort of fortune telling for the snow. Using the models, data and a healthy dose of their own knowledge of the particular area, crews determine what the snow is expected to do in next 12 hours. Our crews are often ski patrol veterans, which can be valuable experience when it comes to evaluating snowpack and predicting next moves. At times, some of their conclusions may seem counterintuitive to motorists. It doesn’t have to be snowing, for example, for the avalanche risk to increase. Roads may look bare and wet, but heavy rainfall puts extra weight on the snowpack that can trigger an avalanche. Warming temperatures – or even several hours of sun during a clear day – can also increase avalanche risks even during seemingly “perfect” pass driving conditions. Can we prevent every avalanche? No. Nothing involving Mother Nature is ever 100 percent controllable. But forecasting avalanche danger helps reduce the risk to motorists and our maintenance crews as well as decreasing the amount of snow available if a natural slide was to occur. And, even though they can be frustrating, that’s the goal of every avalanche control closure: Reducing risks and keeping motorists safe. Last week we reported that crews were making good progress as they worked to install sign foundations on SR 99/Aurora Avenue North in Seattle. Turns out good progress leads to good news: the first phase of sign foundation work is finishing ahead of schedule. By Friday afternoon, median lane closures should be removed and the southbound bus-only lane will be restored to normal operations. roadway surface in order to hold a 7,000 pound steel cantilever structure and a new sign. Sign foundation work isn’t done just yet, though. Beginning Monday, Feb. 8, crews will begin the second and final phase of this effort. They’ll be drilling, placing rebar and pouring concrete for one remaining sign foundation near Comstock Street. This phase is expected to be complete within 2 to 3 weeks and isn’t expected to significantly impact traffic, transit or pedestrians traveling on Aurora. The southbound curb/bus-only lane will be closed near Comstock Street for approximately one block. An additional southbound lane may close overnight. Buses traveling in the bus-only lane will merge into the general purpose lane a few blocks north of where the bus-only lane currently ends. As foundation work near Comstock Street progresses, electrical crews will be installing underground electrical cabinets at the sign foundations, wiring for a new traffic camera and connecting communications lines to the existing overhead system. Electrical work is expected to take 4 to 5 weeks to complete and will require an intermittent, localized lane closure at specific points along southbound SR 99. These closures will be limited to off-peak hours only (10 a.m. to 2 p.m.). Although traffic and travel times are expected to remain fairly normal for the next few weeks, we appreciate your continued patience, flexibility and attentiveness as you travel on Aurora. 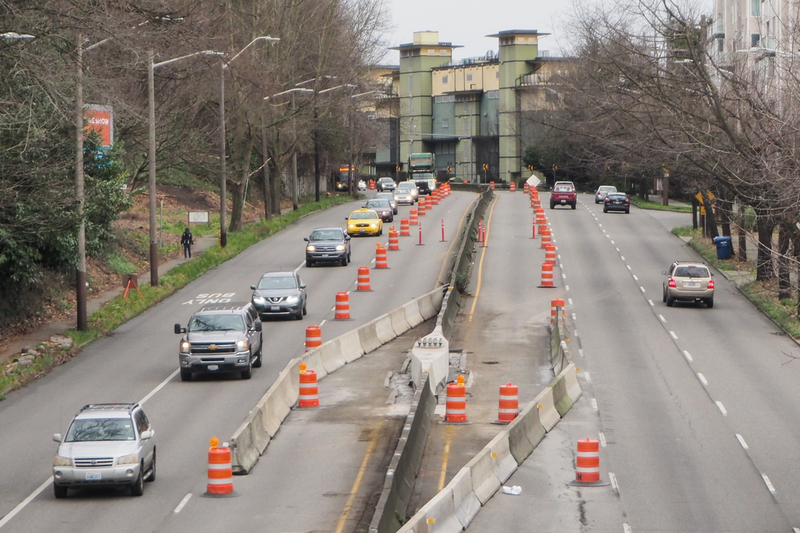 If you would like additional information about the lane closures or ongoing construction at the north end of the SR 99 tunnel, please visit our project website. Why does it seem Snoqualmie Pass is closing more this winter? Let’s be honest, last winter felt more like an extension of summer. We didn’t close Snoqualmie Pass once for avalanche control work. It had just over 100 inches of snow. So driving over the pass didn’t really require the need to check if it would be closed. The weather took a drastic turn this winter. December 2015 was a whopper of a month dumping a total of 193 inches of snow, with 112 of those inches falling the last week of December, breaking the historical snowfall record for a 7-day period. To date, Snoqualmie Pass has received over 300 inches of snow while the 30-year average is about 233 inches for this time of year. This has led to several extended closures for snow removal and avalanche danger. In addition to the weather related closures, two separate collisions involving fuel trucks required day-long closures to safely clean-up the flammable material. The construction project to expand I-90 from four to six lanes is also causing more closures this winter. When the snowshed was removed in 2014, we knew it would take two winters before the first of two new avalanche bridges were finished and would require more closures for avalanche control work. It also meant putting traffic closer to the hillside reducing the space we had to store snow. This summer, crews will shift traffic onto the new eastbound avalanche bridge, so by next winter there should be fewer closures from avalanche control work because our most active avalanche paths along Keechelus Lake will no longer deposit snow onto the highway. By 2018, the westbound avalanche bridge will be finished and both bridges will take drivers up an over a series of avalanche paths that will allow snow, rock and other avalanche debris to go under the bridge piers. 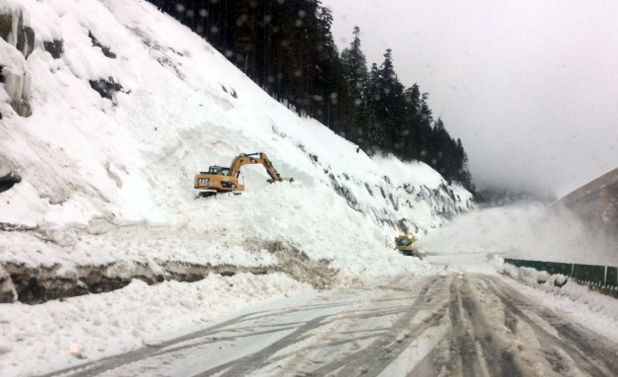 Although the new avalanche bridges and other improvements on I-90 will reduce closures in the winter, there will still be the need to close the pass due to collisions and stalled vehicles as well as some avalanche control work west of the Snoqualmie Pass Summit. Our team of managers and staff on Snoqualmie Pass are well trained with decades of experience. They handle a wide range of duties involving snow and ice removal, responding to collisions and reducing the danger of avalanches. During a snow event, there can be up to 30 pieces of snow removal equipment including plows, graders and blowers on I-90 from Vantage to North Bend. Snow plows push the snow off the highway in tandem from one blade to the next efficiently moving it off the highway. If you don’t see snowplows in bad weather, chances are, they are behind you. Our equipment technicians are on-call 24/7 and work tirelessly to keep all the equipment working on the highway in good repair. We coordinate closely with the Washington State Patrol on traction requirements and closures for unsafe conditions. Our Traffic Management Center staff are in constant contact with crews in the field and monitor cameras, update the website, the highway advisory radio and variable message signs to keep drivers informed on current conditions. 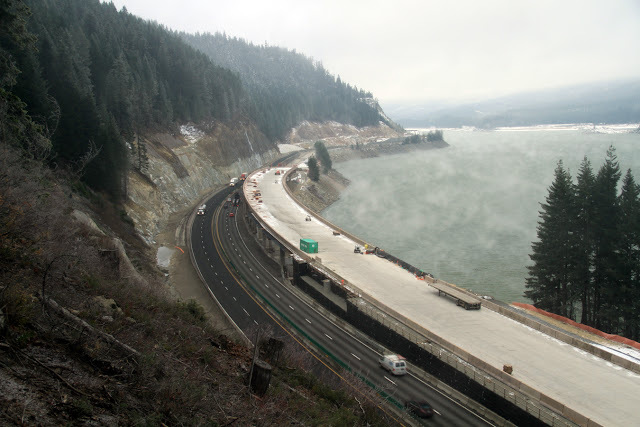 We understand I-90 over Snoqualmie Pass is a vital transportation corridor for our state's economy. Our goal is to efficiently move people and goods across the pass, but our number one priority is safety.